I got this idea from another site, and my recent (and ultimately successful) attempt to finish off a bottle of Pinaud Clubman AS. The plan is for people to post here when they're completely done with a soap, cream. aftershave, balm etc. Given the size of the dens people have, this is not as frequent an occasion as you'd expect. The rules are simple - the item has to be finished, no sample sized items, and pics are nice. 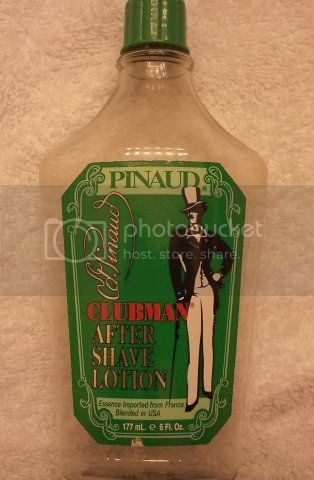 I'll start it off - I just finished a bottle of Pinaud Clubman. It was pretty nice, considering the price. The fragrance is polarizing, but I'll probably buy it again (after I'm done with other aftershaves). I just finished off a bottle of Alt Innsbruck and already have its replacement in rotation. I just finished off a bottle of Clubman Virgin Island Bay Rum. I still need to find a replacement. Maybe try some of the Captains Bay Rum, I hear it's good stuff. The Pinaud Virgin Island Bay Rum is lovely ---- but man! it lets you know when you've had a bad shave. A 'fires of hell' aftershave. (06-22-2012, 06:54 AM)yohannrjm Wrote: Captain's is great.....expensive, though. It is just reminding you that you are alive. (06-22-2012, 06:42 AM)chevyguy Wrote: I just finished off a bottle of Clubman Virgin Island Bay Rum. I still need to find a replacement. Maybe try some of the Captains Bay Rum, I hear it's good stuff. St. Lucia is the best Bay Rum I've used. Not a heavy scent and comes in a glass corked bottle. Great price as well. The biggest plus it that it doesn't reek off clove. I just finished the sample bottle of Krampert's Finest Bay Rum. Now I can start on the new larger size. (06-22-2012, 08:49 AM)slantman Wrote: I just finished the sample bottle of Krampert's Finest Bay Rum. Now I can start on the new larger size. I finally finished off a tube of Palmolive Lemon thankfully. Finished a bottle of speick splash not too long ago, but I refilled the bottle with Osage rub, so the bottle is still hanging around. A tube of Bigelow, a puck of VDH, a bottle of KMF all with last three weeks. About to finish off my Clubman and Gillette Cool Wave AS, so will need to take pictures of those. Finished a tube of Indian Palmolive Lemon today. Been working on it for a while. It's pretty good, without being spectacular. (06-27-2012, 05:00 PM)yohannrjm Wrote: Finished a tube of Indian Palmolive Lemon today. I just finished one of those up myself. I thought it was a pretty good performer as well. The best Lemon soap to me is Caprician Lemon from RR in both scent and performance. Finished a bottle of TSD Patchouli aftershave milk today. I've been using it for a few years now, and it was already pretty low, so it didn't take long to get done. I like the TSD aftershave milks, but the Patchouli scent was.....erm..........interesting. (06-29-2012, 03:54 AM)yohannrjm Wrote: Finished a bottle of TSD Patchouli aftershave milk today. I've been using it for a few years now, and it was already pretty low, so it didn't take long to get done. Being someone who went to a few Phish Shows as well as Widespread Panic back in the day, I have a permanent aversion to Patchouli. Dave, this was one of the few literal LOLs I've had reading a forum. It's funny because it's true & it's true so it's funny. A little Dane paraphrase for those that didn't catch it. I just polished off a bottle of Speick Aftershave Splash. I will have to remember to bring a replacement bottle back from the office. I finished off a bottle of Aqua Velva yesterday.